Meet ultra-low phosphorus limits: Are you facing phosphorus or metals limits that you are unable to meet? Save money with a more efficient design: Tired of balancing dosing rates, floc quality and the excess tankage required for flocculation? There is a more efficient way. Nexom is the exclusive source for Blue PRO® reactive filtration, the simple, powerful tool for meeting ultra-low phosphorus or metals limits. The Blue PRO uses a patented reactive filtration process within our Centra-flo® continuous-backwash media filter to achieve the industry's lowest phosphorus or metals levels with unmatched efficiency. Blue PRO® reactive filtration can be installed into concrete tanks or purpose-built fiberglass or stainless tanks. The Blue PRO filter is built on Nexom's own Centra-flo® continuous-backwash sand filter process (pictured at right). In this process, influent is distributed across almost the entire cross-sectional area of the filter near the bottom of the sand column. Water is filtered as it flows upward, and the sand coated with hydrous ferric oxide (HFO) attracts and reacts with the phosphorus and metals. Sand is moving downward by gravity to an airlift device. While the filtered water exits near the top of the filter, the airlift transports the phosphorus- or metals-laden media up into the washbox where the discharged HFO coating and adsorbed contaminates are separated from the media. Water velocities in the washbox are carefully designed to carry away the contaminates while allowing the media to fall to the filter bed. The freshly scrubbed media from the washbox is recoated with HFO as its cycle begins again. The Blue PRO reactive filtration process overcomes a critical obstacle to achieving efficient phosphorus removal in bulk aqueous solutions by providing a very large reactive surface area within the media bed, resulting in guaranteed contact of phosphorus with HFO and its high adsorptive capacity. The adsorptive surface in Blue PRO filters is a continuously regenerated HFO coating that forms on the surface of the sand media. Coagulation followed by physical separations processes (clarifiers, filters, membranes, etc.) simply cannot compare to the efficiency of adsorptive phosphorus removal. Waste HFO, phosphorus, and solids are removed from the filter through the backwash or reject stream. Recycling this backwash upstream provides the added benefit of phosphorus pre-treatment in primary or secondary treatment systems, further guaranteeing the achievement of the discharge phosphorus target as well as lowering the overall plant chemical ratio. The phosphorus is chemically bound, exiting the site with the plant sludge. Integration of the Blue PRO technology does not require change in the plant's sludge handling system. Blue PRO uses 30% less chemical than comparative technologies for ultra-low phosphorus, therefore producing less sludge. The waste HFO also helps with odor control and can reduce water content in biosolids. The Blue PRO system is available in several models and configurations. The modular nature of the filters allows for ease of engineering system expansion. The filters are available as freestanding fiberglass or stainless steel units or can be integrated in multi-module concrete cells. Control systems and smaller filters may be mounted on skid systems for mobility or ease of commissioning. Can this system also be configured to remove nitrates? Yes, even within the same tanks! Learn more about the Blue Nite® process, or contact us to find out how this capability could impact your plant. 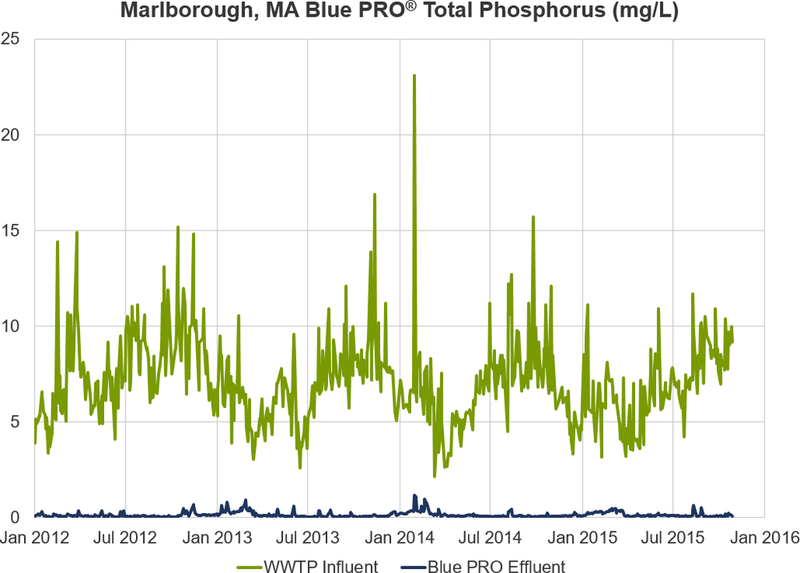 The Blue PRO® process is the only way to consistently meet ultra-low effluent phosphorus levels. Blue PRO installations consistently beat their permitted levels, even with permits proscribing <0.02 mg/L—just 20 micrograms—with a minimum of chemical dosing or waste thanks to Nexom's proprietary reactive filtration. Want to know what Blue PRO could do for your system? Submit your RFP today and our in-house professional engineering team can help you size and design a Blue PRO to meet your wastewater treatment requirements. How much does a Blue PRO® system cost? There are many factors which can influence the cost of a Blue PRO® system, including design flows, loading, treatment requirements, and existing infrastructure. The best way to determine the cost for your specific application is to submit your RFP to our project development team. 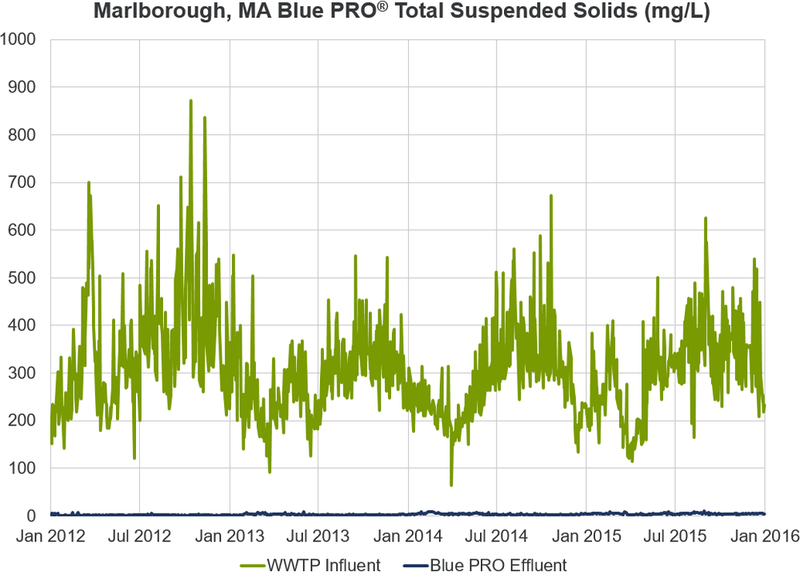 What influent characteristics are required for Blue PRO®? The Blue PRO® is surprisingly flexible as a tertiary treatment. Several systems exist with high-strength influents between 5 and 12 mg/L P and TSS up to 50 mg/L. The ultimate treatment configuration is dependent on the influent loads and on the treatment goal. What other metals can a Blue PRO® system remove? Nexom has Blue PRO® installations that are permitted for aluminum, arsenic, copper, lead, mercury, phosphorus, zinc, and other trace transition metals. Is the system compatible with nitrate removal? Yes! For those looking to meet low total nitrogen or nitrate limits, the Blue PRO process can be easily and efficiently combined with the Blue Nite® process to conveniently remove nitrates and phosphorus/metals using the same infrastructure. You can learn more about removing nitrates on our Blue Nite page. In some cases, the Blue PRO® technology can be retrofitted to existing tanks. Contact our project development to learn how your specific tanks could be integrated with the Blue PRO process. Thanks to the continually-regenerative reactive filtration process, media is not a consumable. The process imparts a temporary chemical coating to the media that is stripped and reformed cyclically in situ. Many older sand filter designs of 20 years ago were prone to occasional media loss. Our washbox design, coupled with our unique control and monitoring systems, mitigates this concern. A Blue PRO system will waste almost no media in its lifetime, meaning that in a 20-year period, topping up is unlikely to be required, and the media should never need to be replaced.